His Eminence, Metropolitan Gregory of Nyssa, is the spirtual leader of the American Carpatho-Russian Orthodox Diocese, which maintains offices at 312 Garfield Street, Johnstown, Pennsylvania, 15906. His Eminence, Metropolitan Gregory was consecrated as Bishop and enthroned as the Ruling Hierarch of the American Carpatho-Russian Orthodox Diocese of the USA on November 27, 2012. His Eminence celebrates his Name's Day (St. Gregory Palamas) on November 14/27. Under His Eminence's care is our Diocesan Christ the Saviour Seminary, also in Johnstown, Pennsylvania, which trains future priests and deacons of our Diocese. In addition, the Diocese maintains Camp Nazareth Youth and Retreat Center in Mercer, Pennsylvania. Metropolitan Gregory also serves as Episcopal Liaison to the Orthodox Christian Fellowship and Chairman of Committee for Agencies and Endorsed Organizations of the Assembly of Canonical Orthodox Bishops of the United States of America. Very Rev. Protopresbyter Peter Paproski was assigned as Pastor of Holy Ghost Parish on November 15, 2018 after serving for nearly 25 years as Pastor of St. John the Baptist Orthodox Church in Stratford, CT. He was ordained as deacon in June of 1993 and as priest in November 1993 by His Eminence, Metropolitan Nicholas of the American Carpatho-Russian Orthodox Diocese of the U.S.A. He was elevated to the rank of Protopresbyter in March of 2009. In addition to serving as Pastor of Holy Ghost Church, Fr. Peter serves as Director of the Diocesan Apostolate For Information Technology and Communications; National Senior ACRY Youth Organization Spiritual Advisor; and as member of the Diocesan Youth Apostolate and Religious Education Commission. Fr. Peter also is involved with College Campus Ministry, and has served as the Northeastern Regional Chaplain of Orthodox Christian Fellowship (OCF). Fr. Peter and Pani Carol are the parents of two grown sons, Daniel and Timothy. Very Rev. Protopresbyter John R. Fedornock served Holy Ghost Church from 2001 to 2018. He was ordained to the priesthood by +Metropolitan Orestes Chornock on September 30, 1962 at St. Mary's Orthodox Church in Endicott, New York. 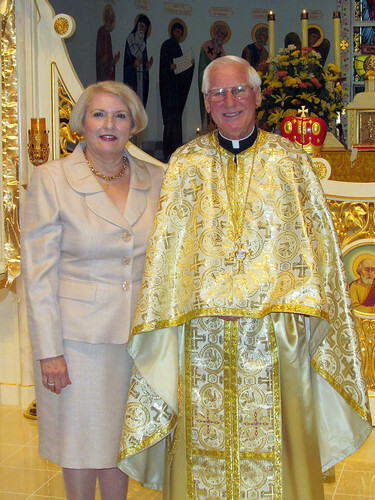 In September of 2001, +Metropolitan Nicholas assigned Father John and Pani Marge to Holy Ghost Orthodox Church in Phoenixville, Pennsylvania. For 17 years at Holy Ghost, Father John and Pani Marge worked tirelessly to support the parish. While at Holy Ghost, Father John had performed 80 baptisms, 25 weddings and 73 funerals. With over 60 children in the parish, Father John and Pani Marge have focused on the youth by supporting programs like the annual hay ride, the annual Christmas play and visit by St. Nicholas, taking our altar boys to the Altar Boy Retreat and children to Camp Nazareth. The number of Liturgies served, confessions heard, Holy Communion distributed, visits to the sick, and prayers prayed during his 56 years as a priest are countless in number. From food sales and bazaars to beautifying the church and its grounds, and everything in between, they have always dedicated their lives to The Lord and the churches they have served. May God continue to grant them good health for Many Happy and Blessed Years! Mnohaja I Blahaja L'ita!